My feelings are pretty neutral about this. At least I didn't pay for this and instead I got it as a free gift for my birthday at Sephora. The color they offered is Rikugien. It's a light pinky rose shade. 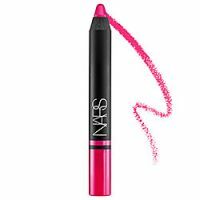 I don't know why Nars calls this a "satin" lip pencil because the color is anything but satin. It has a sheer glossy almost frosty finish that I do not like. It has a lot of shimmer in this and I...read more hate frosty looking lips. This lip pencil is more moisturizing than their matte pencils but it doesn't last as long as that one. It feels nice and barely detectable on the lips but I wouldn't repurchase. I got a mini of this and was excited to try it. The color I got was rikugien, which is a medium, very pretty, natural looking dusty rose. It is very moistuzing, feels nice on the lips, goes on semi opaque, comes in a large range of nice colors. I like the size of the stick. It is between a lip liner and a crayon. It has no scent or flavor to cause irrration or interfere with your palette. On ...read morethe down side, it is quite expensive, is not retractable-requires sharpening, wears off quickly, and bleeds which would keep me from buying a bolder color (unless you are The Joker). I don't hate it, just expected a lot more for the price. I received this product as a birthday gift; Torres Del Paine is a neutral color and I am a medium brown African American woman. The color looks great on me and I receive a lot of compliments. This is my go to lipstick when I am out instead of a lip balm. The only negative point is that you have to use a cosmetic pencil sharper instead of a build in screw product increaser.